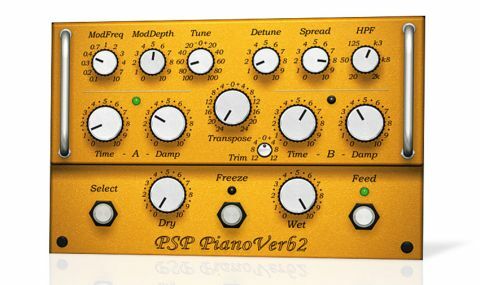 A fantastic update to one of the more interesting reverbs out there, PianoVerb2 is powerful, fun and inspirational. Creative concept and design. More flexible than v1. Excellent Freeze function. Useful A/B switching. Good value. Only a handful of presets. Not suitable as your only reverb. If you've ever listened to the undamped strings of a piano resonating in sympathy with the sounds in a room, then you already have some understanding of what PSP's PianoVerb2 is all about. Some years ago, the Polish company developed their intriguing reverb concept as a freeware plugin, and now it's back, revamped, expanded and pricetagged. "Version 2 adds controls for Modulation Frequency and Depth, stereo Spread, high-pass filter (HPF), Freeze and independent Dry and Wet levels"
PianoVerb2 (VST/AU/RTAS/AAX) mimics the vibrations of piano strings using a series of 12 resonant filters. The ability to tune, detune and transpose these filters enables it to produce a wide range of effects, from traditional artificial algorithmic room reverb to twangy, modulated sounds. The original PianoVerb featured controls for decay time, damping, transpose (+/-24 semitones), tune (+/-100 cents) and detune. Version 2 extends this with Modulation Frequency and Depth, stereo Spread, high-pass filter (HPF), Freeze and independent Dry and Wet levels. There's also a dedicated Feed control, which enables you to manually switch the input into the reverb on and off (See Freeze frame), and you now get two sets of time and damping controls for quickly switching between two different settings, for A/B comparison. The legending on PianoVerb2 varies from suitably specific (HPF frequency) to frustratingly general (1 - 10 for decay time), and there are only a handful of preset patches, so you just have to roll up your sleeves and get stuck in. Thankfully, the underlying tuning controls are at the more specific end of the scale, and Transpose in particular proves to be key. At the lower end (towards -24 semitones), you get a typical algorithmic reverb effect. At the upper end (towards +24 semitones), the sound becomes ringy and metallic. "The tuning controls allow you to to focus the effect towards, or even away from, the specific pitch of your source material"
Naturally, there's a whole raft of effects between the two. This basic setup can then be bent with the Tune control, which lets you fine-tune your chosen Transpose setting, and the Detune control, which gradually detunes the 12 filters in relation to each other. If you approach PianoVerb2 like a typical algorithmic reverb, then the decay time, damping and high-pass filter will, understandably, be your first ports of call. But important though those are, it's the tuning aspect that really powers this plugin. It not only allows you to produce crazy pitched effects, but also to focus the effect towards, or even away from, the specific pitch of your source material. OK, it's not pinpoint accurate, but different transpose settings emphasise different pitches, which can be great for creating tailored spaces for snares and kicks, or adding interest to synth stabs, pads and other instrumentation. In general, unless we were after something particularly weird, we found the lower half of the transpose range (0 to -24 semitones) worked better than the upper half. Similarly, keeping the ModDepth low helped keep the craziness under control. Even so, when using the Freeze function, we found the modulation great for smearing the sound. The original PianoVerb was much loved, and although version 2 is a paid-for plugin, given the low price, we see no reason why it shouldn't pick up as much support, if not more. It's a great little processor that we're sure you'll keep coming back to for spaced-out, frozen reverbs, or just whenever you're in need of some sonic inspiration.